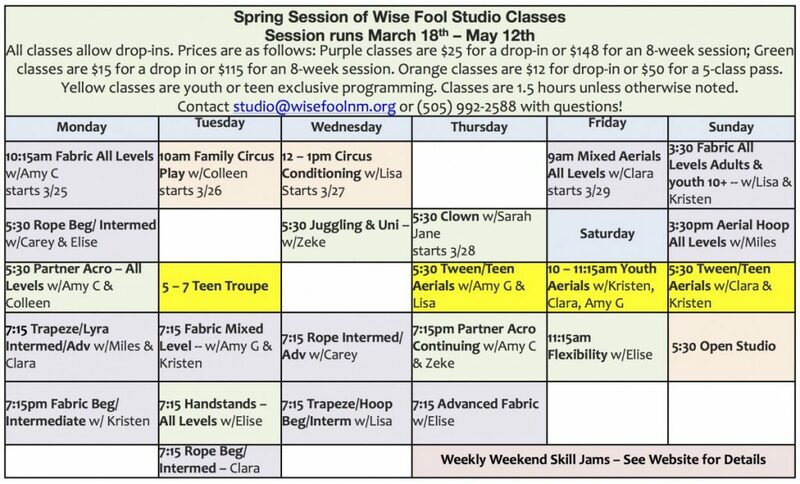 Wise Fool welcomes adults and teens of all ages, genders, fitness and experience levels to join us for ongoing classes in circus arts! Please note that our class schedule changes from session to session. 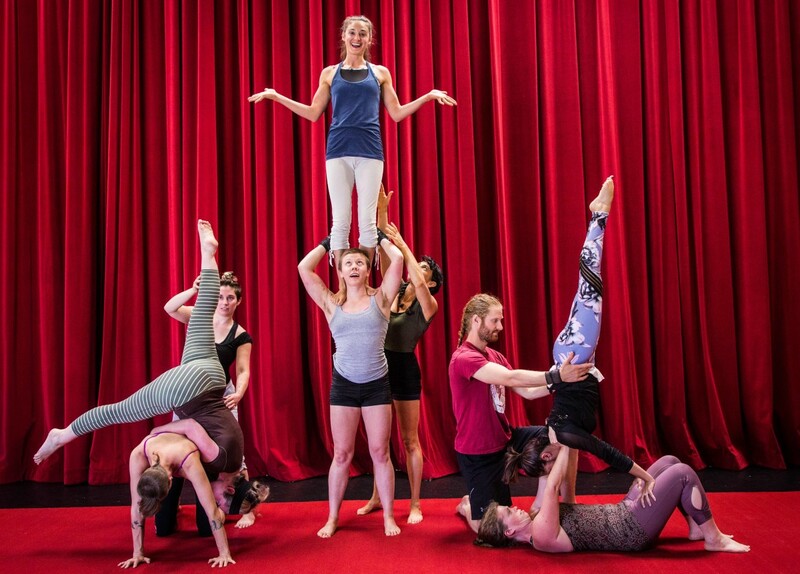 Disciplines taught throughout the year may include trapeze, lyra, aerial fabric, partner acro, flexibility, juggling, unicycling, handstands, conditioning, and more. Join our mailing list to receive email announcements about new classes! All students will need to sign a new waiver. The information will transfer from the waiver into your new VAMP user account. Registration for green and orange classes will be under "Register for Drop-In Class". Registration for purple classes will be under "Register for Session Class." Please feel free to call or email Kristen at studio@wisefoolnm.org or 505-206-0160 if you have a hard time registering. Descriptions of each class and levels below the schedule. Please note, it is Wise Fool's policy that if there are less than three students in a class on any given day, the class will be 1 hour instead of 1.5 hours. If there are less than 2 students, class will not run. Also--please note that unless otherwise noted, purple classes are for folks ages 16+. Green classes are ages 13+. For class descriptions, see list below. 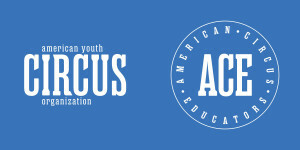 Limited tuition assistance is available. CLICK HERE TO APPLY. 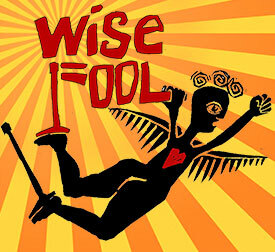 Contact Ilana at studio@wisefoolnm.org with questions! Learn more about our circus arts classes below by clicking on the class title (listed alphabetically). These include a guide to levels. Please note that classes available varies from session to session. See schedule above for current offerings. We hope to see you soon! 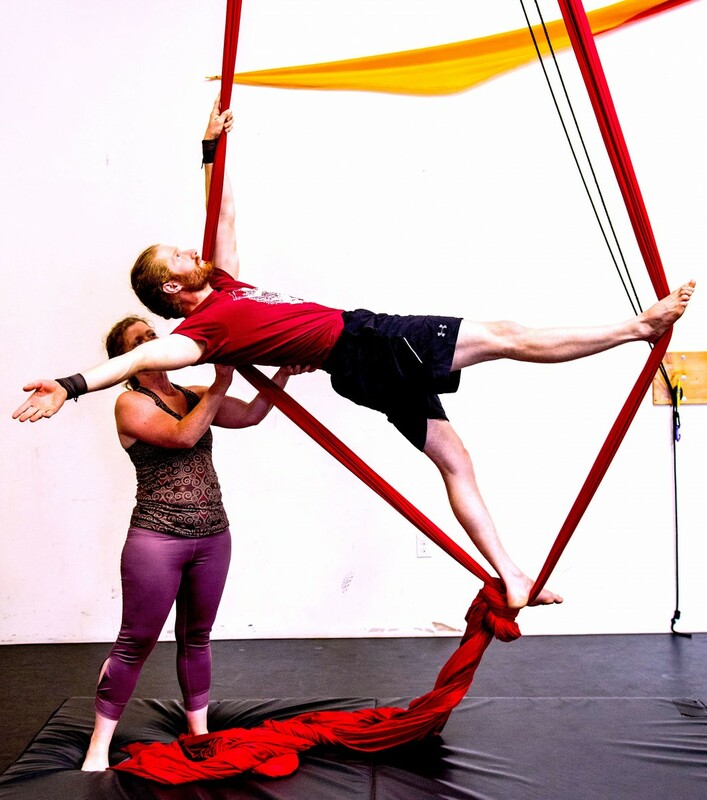 Learn or further develop the fundamentals of aerial fabric, sometimes called "silks". This course will include climbing, wraps, foot locks, drops, and poses. From conditioning and basic skills to explorations in choreography, fabrics are a fun way to build core strength and flexibility while defying gravity! Pre-registration is encouraged as classes fill up fast! Sign up for one or more classes per week. Mixed Level Fabric: suitable for complete beginners all the way through advanced students. Fabric 1/2: designed for total beginners or students who are working on sequences 2 & 3, you will learn the fundamental skills and build strength. Fabric 1 - 3: for beginner students up through students working on sequences 3, 4, 5 and 6. Advanced Fabric: for students who have completed sequence 6 and up, must be able to invert in the air and feel comfortable with multiple drops. Contact studio@wisefoolnm.org if you have a question about which level is right for you. Aerial rope, also known as corde lisse, is a challenging but exciting aerial apparatus. Students will learn to climb, hold themselves in various positions, wrap for and perform drops and explore movement quality. Beginner/Intermediate: Suitable for students with no experience through to students who are working on beats and multiple climbs. Intermediate/Advanced: For students with previous experience on rope who are comfortable with beats, inversions and at least beginning to explore roll-ups and open drops. Want to get a well-rounded circus experience? This drop-in, donation-based class is for you! This class will include stilt-walking, Rolla bolla, walking globe, juggling, basic tumbling and partner acro. Absolutely no experience necessary, suitable for folks ages 10 and up. Suggested donation $5 - $15 but no one turned away for lack of funds. Via the red nose clown, we will explore comedic timing, stage presence, breath, the absurd, problem solving in the clown world, stillness, character development, and improvisation in duos and trios. This class is great for a deeper recognition of who we are and what we have to offer on stage, from circus to Shakespeare. It is all about authentic expression and tapping into our own inner clown. If you've taken this class with me before, come take it again. Many students do this as there is so much to learn and practice over and over again. All levels welcome. This class is suitable for folks at all levels who want to better understand how their body works, set stretching goals, develop active flexibility and increase range of motion. This is a perfect complement to aerial and acrobalance classes. Whether you're completely new to going upside down or you're looking for a fun way to gain strength and stamina in your handstands, this class is sure to be a fun and tough workout! Handstands can be a very slow but rewarding process and this class will give you the tools you need to work towards better lines, balance and fun shapes. This class is best suited for students who are comfortable kicking up into a handstand at the wall or with a spotter. Intro to aerials is the perfect way to start on your aerial journey. This is a four-week session only class in which you will get to try aerial fabric, trapeze and hoop. A perfect class for beginners, the class will focus on basic technique, conditioning, and building body awareness in the air. No experience necessary. Suitable for folks of all body sizes, genders, and fitness levels. Can't decide which aerial apparatus you like best, this is the perfect class for you! Suitable for all levels, this class will develop skills and choreography on the aerial fabric, trapeze, and hoop. The class will also include conditioning, creative development, and building body awareness in the air. No experience necessary. An opportunity to practice what you're learning in classes. Supervised but not a led class. No registration necessary for drop-ins. $10 drop in for currently enrolled students, or buy a 5 pass for $45 or 10 pass for $85. Open studio passes are valid for a full year. Also known as "acroyoga", Partner Acro involves sharing weight and balancing between two or more people. We'll explore acrobal­ance from the circus per­spec­tives, blending trust and con­nec­tion with dynamic play, flex­i­bil­ity for mind and body, and phys­i­cal con­di­tion­ing. Acrobalance will lit­er­ally turn you upside down and give you a whole new per­spec­tive on your poten­tial to be both strong and sup­ported from the ground up into the air. No partner necessary! Partner Acro -- Continuing: Suitable for students with a minimum of six months of acro experience. Regular classes don't fit into your schedule? Passing through town and want some special attention? Just looking for a more personalized circus experience? Private lessons are for you! Private lessons are $60/hour. 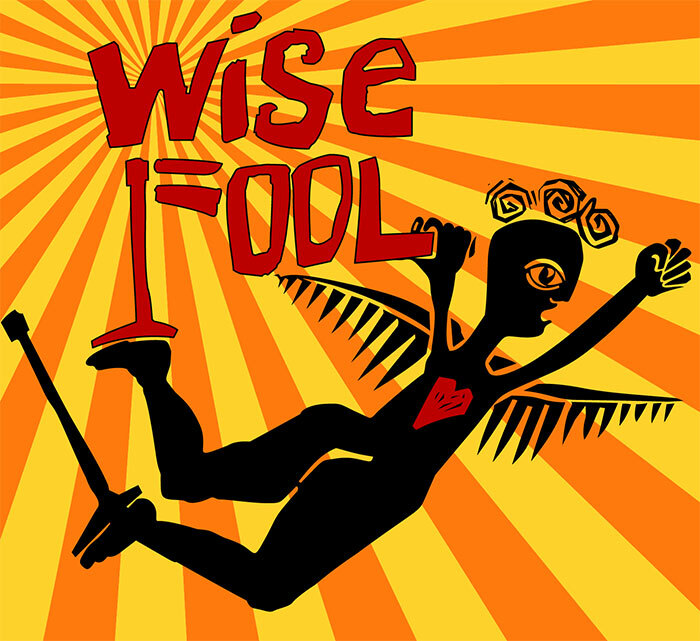 Email studio@wisefoolnm.org to book your lesson. The quintessential circus discipline, and a great way to build strength and coordination for other aerial apparata. Class includes a dynamic warm-up, floor exercises and aerial vocabulary, technique, and conditioning on static trapeze & lyra/aerial hoop in a supportive, non-competitive environment. Trapeze and Lyra are hung low at 3' to 7' high. See descriptions below for which level is right for you. Trapeze/Lyra Beginner/Intermediate: for brand new students through students working up to level 4 on Lyra and up to level 7 on trapeze. Trapeze/Lyra Intermed/Advanced: For students working level 4 and up on Lyra and/or 7 and up on trapeze. Lyra All Levels: for students wanting to focus exclusively on Lyra. Must be open to exploring spinning. We do not currently offer any tumbling classes. We do offer basic tumbling instruction in our Circus Foundations and Partner Acro classes. And tumbling privates for youth and adults may be available depending on teacher availability. Learn the basics of unicycling and juggling or add on more advanced skills to your juggling and equilibristics practice. Suitable for all ages (7 and up) and all experience levels. I'm ready to sign up! Take me to registration.